The Outcast is FREE today on Amazon! Click the image to be taken to the Kindle store. Raised in an Old Order Mennonite community, Rachel Stoltzfus is a strong-willed single woman, content living apart from mainstream society until whispers stir the moment her belly swells with new life. Refusing to repent and name the partner in her sin, Rachel feels the wrath of the religious sect as she is shunned by those she loves most. She is eventually coerced into leaving by her brother-in-law, the bishop. But secrets run deep in this cloistered community, and the bishop is hiding some of his own, threatening his conscience and his very soul. When the life of Rachel’s baby is at stake, however, choices must be made that will bring the darkness to light, forever changing the lives of those who call Copper Creek home. For today only, Amazon has selected Jolina Petersheim’s The Outcast as their Kindle Daily Deal. Raised in an Old Order Mennonite community, Rachel Stoltzfus is a strong-willed single woman, content living apart from mainstream society until whispers stir the moment her belly swells with new life. Refusing to repent and name the partner in her sin, Rachel feels the wrath of the religious sect as she is shunned by those she loves most. She is eventually coerced into leaving by her brother-in-law, the bishop. But secrets run deep in this cloistered community, and the bishop is hiding some of his own, threatening his conscience and his very soul. When the life of Rachel’s baby is at stake, however, choices must be made that will bring the darkness to light, forever changing the lives of those who call Copper Creek home. Don’t miss this amazing deal! Today only, purchase your copy of The Outcast ebook for Kindle for just $1.99. In honor of this Daily Deal, Jolina is hosting a GIVEAWAY CELEBRATION on her author Facebook page today. Be sure to visit!! 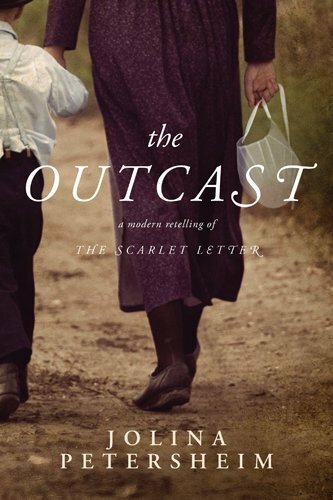 Jolina Petersheim has a gift for writing, which is proven by her debut novel, The Outcast. You will quickly find yourself drawn into the community Jolina so vividly describes. The unique narration, through two different points of view, allows the reader a deeper understanding of the members of this cloistered community. The Outcast is a story of life and death, love and loss, and secrets and surprises. However, its most important message is that of forgiveness and the power that lies therein. I look forward to reading more from Jolina Petersheim! Her second novel, The Midwife, is a story about an Old Order Mennonite midwife and an Englisch woman who both claim the same child, and what it means to be a mother: genetics or love. The Midwife will be released in Summer 2014. Jolina Petersheim holds degrees in English and Communication Arts from the University of the Cumberlands. Though The Outcast is her first novel, her writing has been featured in venues as varied as radio programs, nonfiction books, and numerous online and print publications. Her blog is syndicated with The Tennessean’s “On Nashville” blog roll, as well as featured on other creative writing sites. Jolina and her husband share the same unique Amish and Mennonite heritage that originated in Lancaster County, Pennsylvania, but now live in the mountains of Tennessee with their young daughter.